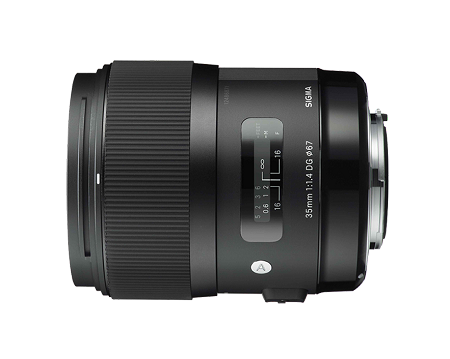 The 35mm f/1.4 DG HSM Lens for Nikon DSLR Cameras from Sigma is the first entry into Sigma's Art series of professional lenses, with an emphasis on artistic expression and the creative potential of the lens. With a bright f/1.4 maximum aperture, floating inner focusing system, and Hyper Sonic Motor (HSM) you'll have quick and accurate control over the artistic effects achieved by the lens' high quality elements. For wide angle photography, this 35mm lens and its circular 9-bladed f/1.4 aperture ensure excellent brightness and blurred background (bokeh) effects. The Super Multi-Layer Coating reduces flare and ghosting and provides sharp and high contrast images even in backlit conditions. The lens' Hyper Sonic Motor (HSM) and floating inner focusing system ensure that you experience quick, quiet and precise autofocusing whenever you need it. Adjust focus using either autofocus (AF), or full-time manual focus, without having to switch camera modes or change settings - just flick the switch from AF to MF. For greater build quality and strength, all metallic parts and the new Thermally Stable Composite compound material (TSC), are housed internally. Its brass made bayonet mount has both high accuracy and durability, and a special treatment is applied to its surface giving it greater strength and making it highly resistant to long-term daily use. Rental Includes: Lens, front and rear caps, lens hood, 67mm UV filter.